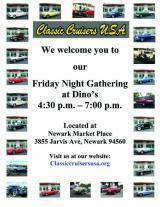 Come Join us for a couple hours to hang out and see some great cars. Everyone welcome to bring what they have and hang out. No year restrictions or make model restrictions. If your proud of what you have come share it with other car enthusiasts.